Book hotel rooms online with us at Tivoli Marina Vilamoura Hotel at the lowest rate, guaranteed. 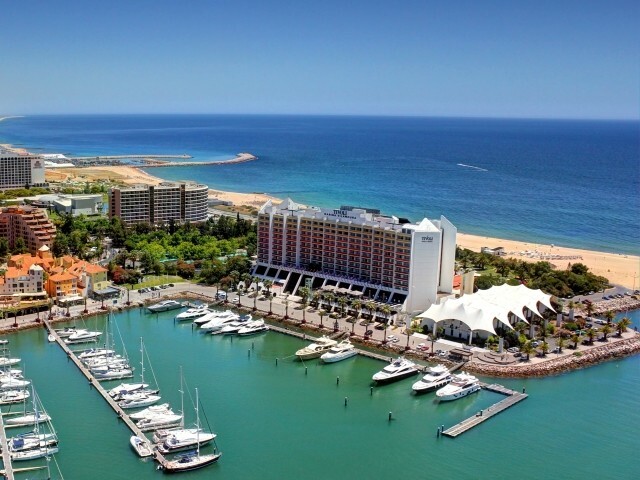 Get your holiday discount room rate at the 5 Star luxury Tivoli Marina Vilamoura Hotel located on the Marina in the popular golf resort area of Vilamoura in the central Algarve. The hotel has 383 comfortable suites providing holiday accommodation from two to six adults (connecting rooms for four adults). The Tivoli Marina Vilamoura Hotel is set in 30.000 sq. metres of garden and overlooks the boat Marina on the north side and directly onto the beach on the south side. The Tivoli Marina Vilamoura Hotel has the Essence of Angsana Spa with massages and beauty treatments. The modern comfortable suites are air-conditioned have satellite and cable TV, radio, direct dial phones, executive desk, a mini-bar, a safe, luxurious bathrooms and internet access. Tivoli Marina Vilamoura Hotel facilities include the Spa, three restaurants, four bars, an indoor pool, a large outside pool and one for children, a floodlit tennis court, a 18-hole putting green with a practice bunker, a Business Centre and a well-equipped Fitness Centre. There are the many shops, bars, and restaurants around the Marina with a lively nightlife. Guests will find adequate parking on the site.